Kyoukai no Kanata — 06 | Mezashite! 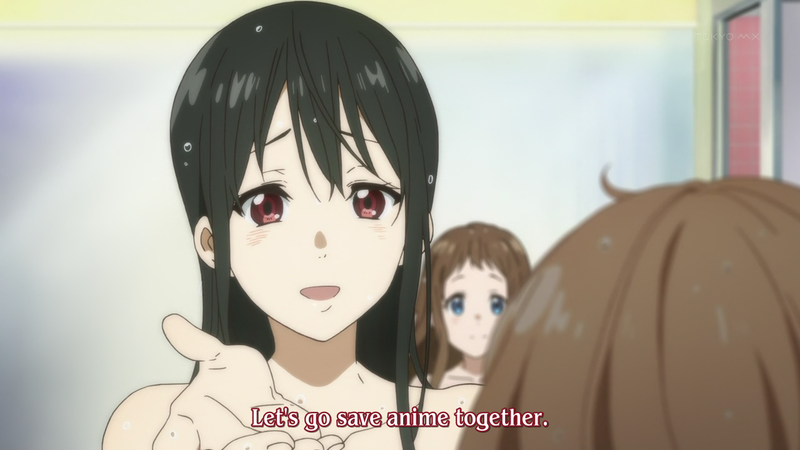 KyoAni, saving anime one pair of glasses at a time. You’ll see. Oh, right, Aikatsu is delayed for at least a day. Rewatch this episode of KnK in the meantime, it’ll make everything better. ALSO, work on the batch is coming along. It’s going to be a whole lot better than our original releases. This entry was posted in Uncategorized by Akatsukin. Bookmark the permalink. Oh gods what did they do to this show this week? They used it as an excuse to have a song. It feels like a filler episode. Did they really need one for a 13 episode series? Well… I guess “Toi aussi” is what you wanted to say. It’s actually Latin. Literally, it means “You too, Kuriyama-san? !” You can read more about it on wikipedia. Oh! Didn’t know Latin could be that close to French. Thanks, I learnt something today.